Perhaps there should be a subgenre of action/thrillers called “Badass on a Plane”. 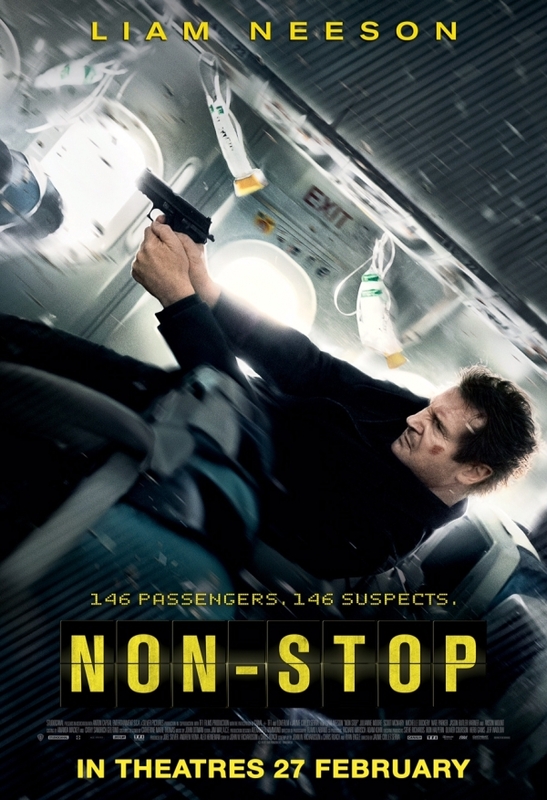 In Non-Stop, Liam Neeson joins the ranks of Wesley Snipes, Kurt Russell, Harrison Ford, Samuel L. Jackson and Jodie Foster as a man on a mission stuck in one of those scary metal tubes 40 000 feet in the air. Neeson plays U.S. Federal Air Marshal Bill Marks, who boards a non-stop flight from New York to London on duty. He receives a series of ominous text messages from an unknown sender aboard the plane, threatening to kill one passenger every 20 minutes until a sum of $150 million is paid. With the help of Jen (Moore), the woman in the next seat and Nancy (Dockery), the head flight attendant, Bill must apprehend the perpetrator. Anyone could be a suspect, including fellow air marshal Jack Hammond (Mount), schoolteacher Tom Bowen (McNairy) and NYPD cop Austin Reilly (Stoll). Non-Stop reteams Neeson with Jaume Collet-Serra, who directed him in Unknown. Non-Stop continues Neeson’s second wind as a tough action hero, though it is a suspense thriller rather than a straight-up action flick. In Unknown, Collet-Serra created a stylish atmosphere and a genuinely intriguing mystery that crumbled more than a little by the time it reached its conclusion, and Non-Stop is similar in those regards. While Non-Stop’s twist ending isn’t as crazy as the one in Unknown, audiences will still find themselves trying to thread together the narrative loopholes afterwards. Collet-Serra is great at setting moods. Here we have a whodunit on a commercial airliner and Non-Stop plays on many of the fears a good number of travellers face every time they board a plane. There are several clever visual touches, like a moment in which Bill is surrounded by floating graphical representations of the text messages he is receiving, almost like they are closing in on him. There are also some cool camera moves: in one scene, the camera sweeps laterally down the aisle of the plane, then zooms outwards, crosses the exterior of the fuselage, and zooms back in to the rear of the cabin. The screenplay by John W. Richardson, Chris Roach and Ryan Engle is taut if far from watertight, effectively ratcheting up the tension. Liam Neeson plays the same gruff, grizzled do-gooder archetype he’s been playing a lot in his later career, meaning he doesn’t get to show off his range but he is what the fans what to see him as – a badass. The Bill Marks character isn’t given a lot of depth, and is established upfront as a troubled alcoholic and smoker prone to violent outbursts. There are times in the film when the characterisation of Bill crosses over from “flawed” to “possibly at least a little incompetent” and he does get critically outsmarted by the mystery villain. But should one choose to say “here’s a tough guy on an airplane and I don’t really need to know more about him”, Non-Stop can be enjoyed. Neeson is unflinchingly serious, and don’t call him Shirley. Non-Stop also reunites Neeson with his Chloe co-star Julianne Moore, who is a friendly, helpful and comforting presence that we as an audience are still supposed to question. It’s not the best use of her talent ever but we’re not complaining. Downton Abbey’s Michelle Dockery is believable as an attentive, cool-headed flight attendant but it is a pity that Lupita Nyong’o, the breakout star of 12 Years a Slave, gets very little to do here. We have a veritable fish market of red herrings and the actors playing the passengers are generally decent, House of Cards’ Corey Stoll particularly arresting. A theme that unexpectedly crops up in Non-Stop is that of the role that mass media plays in unfolding crises and an instance in which sensationalist news coverage is satirised is pretty interesting. Unfortunately, the film falls back on clichés and stereotypes, bending over backwards to be politically correct in its portrayal of Islamic character Dr. Fahim Nasir (Metwally). There’s also the obligatory “motive rant” speech, in which the culprit lays out the rationale behind the evil plot which makes less sense the more one thinks about it. On the whole, Non-Stop is a fairly entertaining and thrilling diversion and even though the pay-off is not altogether satisfying, Non-Stop is sufficiently absorbing in the moment and this reviewer did get invested in the mystery. It’s one of those “don’t think too hard about how it all fits together” movies, but it emerges above average thanks to the stylish direction and its dependable leading man. Summary: The title isn’t the only thing silly about Non-Stop, but there’s an adequate “grip the armrests” quotient and is unlikely to wholly disappoint Liam Neeson fans even though it doesn’t quite soar.